Panel Discussions: Design in Sequential Art Storytelling, Durwin S. Talon, TwoMorrows Publishing, 2007 (c2002), ISBN 9781893905146, 205pp. There’s a presumption among people that if something looks easy or simple, that it must have been easy or simple to create. Most people look at a page of a comic book and think, “Anyone could do that.” But until you actually try and write a comic or draw a comic page do you start to understand the painstaking craftsmanship that is the hallmark of most comics out there. This need to actually “try it out yourself,” is a reason why I have my students write a comic script (and also the reason for the existence of creative writing in the high school and undergraduate education). Although we are creating stories and scenes in our heads all the time, being able to translate that to the page is the difference between consumer and producer. With that in mind, let me suggest for everyone who ever wanted to learn about the tricks of the comic trade to look for Panel Discussions, a series of interviews conducted by Durwin S. Talon, a professor of sequential art at the Savannah College of Art and Design in Savannah, Georgia. While it shares some similarities with other dissections of the comic art like Scott McCloud’s Understanding Comics and Will Eisner’s Sequential Art, Talon’s book is slightly less formal in its structure, but makes up for that in the diversity of its points-of-view. 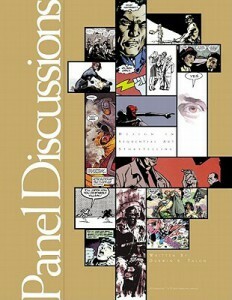 The title itself is a pun, for not only are we discussing the panels of a comic, the format is similar to a panel discussion at a comic convention. Talon goes one-on-one with some fine artists like Will Eisner, David Mazzucchelli, and Mark Schultz, and has them break down the way they structure a comic page, how they get the reader’s eye to move from point A to point B, and how light and dark play into the design. Trying to read this all the way through is difficult, like hopping from room to room at a convention without taking time out for lunch or dinner. Instead, you should space this out, preferrably by reading the artist’s comments, then taking the time to check out some of their work before moving on to the next. Unfortunately, that could be an expensive task unless you have a wonderful graphic novel section in your local library (don’t be surprised–librarians are getting hip to the art form and they are growing collections). With that in mind, I hesitate to suggest this to the casual reader, just as I wouldn’t suggest a casual novel reader to check out Umberto Eco’s commentary Six Walks in the Fictional Woods. But if you want to learn more about the underpinnings of the form, this is an invaluable text. Talon and his publisher, TwoMorrows Publishing (who are filling the gap in practical comics scholarship–as opposed to academic comics scholarship–left by Fantagraphics), are to be commended, and I’m anxious to pick up some more texts by both.